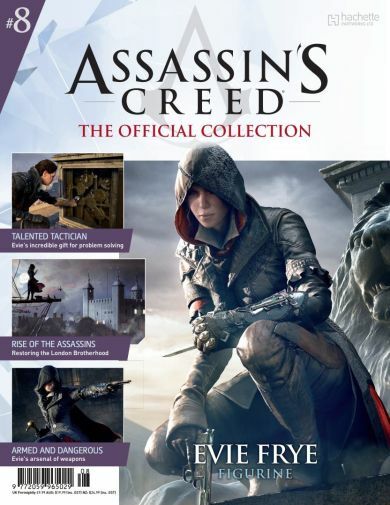 Enter the action-packed world of Assassin's Creed with your Evie Frye figurine. Based on a wealth of artwork supplied by Ubisoft, the sculptors first produce a wax model. In collaboration with Ubisoft, this model is then refined through several stages to capture accurately every detail and angle from the original character in order to create a highly detailed master mold for the figurine. Artists then hand-paint each cast figurine with the utmost precision. Your figurine also comes with a fascinating magazine detailing the character, weapons and mythology of your figurine. 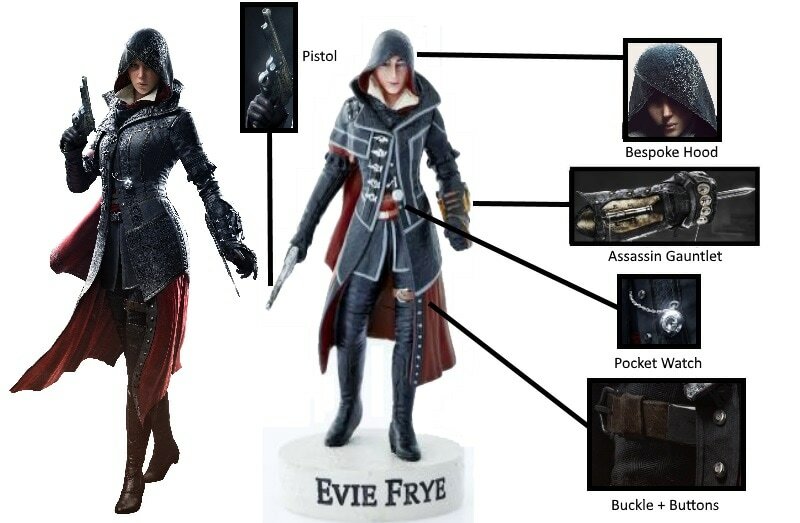 The Evie Frye Figure is only the third recreation of the character available on the market for AC fans, the first being "Evie Frye: The Intrepid Sister Statue" and second being a Funko Pop Figure. (Evie did not get a McFarlane Toy). This version of Evie is the smallest in size, but holds many hidden details that can be found upon inspection. Looking at Evie's Hood, we can see that the sides overlap each other, creating a slight peak. The peak is more noticeable from the side, but the indent lines on the hood are extremely clear, something that is accurate to the Hood worn by the character. One thing I did notice however is that Evie's Hood lacks the floral pattern we see in promo images (and the game), and instead uses dents to create a pattern. The Left Gauntlet is an excellent recreation, and includes the brass knuckles, rope launcher and hidden blade, all painted in the correct colours. You can even see a hint of green, where the dart gun is attached. Evie's Pocket Watch is attached to her Jacket, and is painted in silver. This is an important part of her character, as she is the more calculating of the pair. The addition of a pocket watch is down to voice actress Victoria Atkin, who thought Evie would be more time conscious when preparing for a mission than Jacob. Evie's jacket features a distinct pattern running down the back, that can be noticed upon close inspection. The white collar stands out amongst the black coat, reminiscent of the open collars found on the robes (AC2, Brotherhood) of Ezio Auditore. The Pistol in her right hand is silver, painted in a glossy format that catches the light. The Evie Figurine is a great addition to any collection, and her robes are excellent.